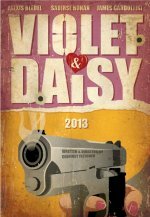 Violet and Daisy release date was Friday, June 7, 2013. This was a Limited in theaters release. Stars Saoirse Ronan and Alexis Bledel as two young, pop culture-obsessed assassins in New York City who accept what they think will be a quick and easy job until an unexpected target, played by James Gandolfini, throws their plan into chaos. Premiered at the 2011 Toronto International Film Festival. The film, described by The Hollywood Reporter as "a surreal fable," is Oscar®-winning screenwriter (Precious) Geoffrey Fletcher's directorial debut.